I recently visited an intriguing guy, Kenji Ichishima, who is a good friend, a distant relative, and the president of Ichishima Sake Brewery Incorporated. He was born and bred in Shibata City, but he spent many years in the USA and studied at a university there. For the last five years, his company has been targeting the international market. Also, as chairman of both the Japan Sake Brewers Association Junior Council and Niigata Sake Brewers Association, he has been pushing other breweries to expand their reach outside Japan. According to him, the trendiest venues in New York City for young couples to get together are Japanese restaurants and sushi bars and many people have been turned on to the joys of drinking sake. He also said that there has been a noticeable increase in the number of scenes in movies and TV shows that show people drinking sake. Kenji is particularly interested in expanding into the American market and he visits there quite often. When he does, he displays his brands at events and trade shows and tries to meet as many people as possible who might be interested in his brews. One thing that he told me about the American market that I found interesting was that rather sweet sakes with only 10-percent alcohol content are very popular. I, like most Japanese, am not a big fan of sweet sakes. The style I prefer is “tanrei karakuchi,” which is light, crisp and dry. Kenji found this interesting as well. He told me that Americans who really know sake usually prefer the drier brands with higher alcohol content. Regardless of your preference, my friend may have the sake that fits your taste. So, if you are visiting the Niigata area, stop on by as his company allows visitors to watch the sake-making process. He also maintains a small museum about the history of the company and the Ichishima family. In it, you can see many historical and valuable items, including calligraphy by Aizu Yaichi and Ichishima Shunjo. The Furusato Festival was held in the Shitada District of Sanjo City on the 28th, August. The word “Furusato” implies a love for one’s rural hometown, and Japan is full of a variety of local summer festivals characterized by food stalls, traditional dancing and music, and huge fireworks exhibitions. Shitada’s festival was no exception, but it also put on two more unique events. One is the National Big-Stone Throwing Contest. This event honors a local ruling warrior, Ikarashi Kobunji, who, legends tell us, was a mighty man and born from the Giant Rainy Snake of Maoiga Ike Lake and a human girl from the hamlet of Kasabori. The word “national” may be an exaggeration, but I am unaware of other contests in Japan where participants, both individuals and family teams, compete by throwing bowling-ball-sized stones. The other remarkable event is the Parade of the Great Snake. In this event, young men carry an “omikoshi,” or sacred shrine shaped like a giant snake, parading it from the Yagi Shrine to the bottom of Yagigahana Cliff. Yes, I admit that the Sekikawa Snake Festival, which is up in the northern part of Niigata Prefecture, is more famous and their snake, which measures 82.8 meters in length and weighs 2 tons, is more splendid. The Guinness Book of Records has authorized that Sekikawa’s snake is larger than Shitada’s, but size is not everything. The people of Shitada’s love for and enjoyment of their own Snake Festival and the legendary love story behind it cannot be measured by tape or scales. In a nutshell, the legends tell of a young lady and her mother who happened upon a wounded young warrior, nursed him back to health and came to like him very much. After he recovered, he told the ladies that, for reasons unknown, he had to leave. The girl, however, was in love with him and wanted to know where he would be heading, so her mother told her to stitch a string in the hem of his clothes. Later, she followed the string until she reached the lake and found that he was actually the embodiment of the Giant Snake of Maoiga Ike Lake. 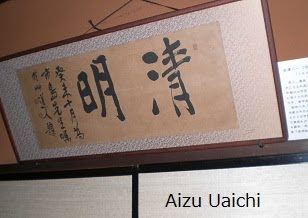 You may associate my family name, Ichishima, with Ichishima-Tei (the mansion and garden of Japan’s second wealthiest landowner, preserved as part of the cultural heritage of Niigata Prefecture), or, perhaps, Ichishima Shuzo (a very notable Sake brewery in nearby Shibata City). Or if you have a good knowledge of Japanese literature, history and politics, you may be reminded of, amongst others, Aizu Yaichi (an essayist and art historian), Ichishima Shunjo (one of the founders of Waseda University) or Ichishima Tokujiro (the first president of Daishi Bank), or Ichishima Michio (a poet). They are all from branches of the Ichishima family tree. I belong to the Rokunojoke Branch. Recently, I pieced together a brief history of the Ichishima families based on old newspaper articles and books, including KabyoNoSheHi, and Kaken (the family’s constitutional law book), which were published exclusively for members of the ten family branches and a few other people. The most famous of the Ichishimas was “Gono,” a giant landowner. The Soke family (the “head family” or the “main-branch family”) was the largest land and forest owner in Niigata Prefecture before the start of the Second World War. Two thousand six hundred peasants worked in the rice paddies for the great landlord. Their land holdings were second only to the Homma family of Yamagata Prefecture. The Ichishima residence, built in 1876 in Toyoura, Shibata City, is now preserved as a museum, and is open to the public. Unfortunately, a strong earthquake destroyed “Kogetsukaku,” a pomp-filled guest palace, in 1995 and, presently, there is no plan to rebuild it unless private benefactors can be found to provide financial support as government coffers are limited. The Ichishima Family originated more than four centuries ago in Ichijima Town in Hyogo Prefecture as a family without a surname. 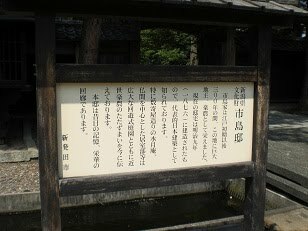 However, when the Feudal Lord Mizoguchi was ordered by Toyotomi Hideyoshi, the daimyo who unified the political factions of Japan in the Sengoku period, to transfer from Kaga (Ishikawa Prefecture) to Shibata Castle, the first “Jihei” in the family followed him and settled in Ijimino, Shibata in 1598. One of his great-grandsons, even though he was the eldest son in the family, moved away from the family home to a neighboring town, “Suibara,” and rose to power, establishing the Soke family. Other family members settled in parts of Shibata City. One, “Rokunojo,” who was favored by his father, inherited the original place in Ijimino, and established the family’s Rokunojo branch. All family branches have had ups and downs during their histories, but the Soke family had been one of Japan’s largest landowners from the early Edo Period until a decade after World War II. Though the different branches of the family often went separate ways, the 185-article family constitution that bound them together strongly emphasized the importance of family ties and cooperation. 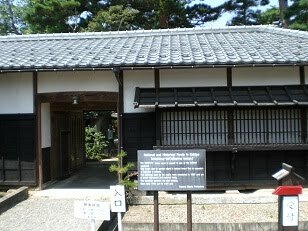 One of its tenets was that “No family abandons another in trouble.” Thus, when the Rokunojo family faced less prosperous times and had even teetered on the verge of bankruptcy, its members were granted a share of the Soke family’s holdings, including a mansion in the same town as Ichishima Tei. However, the emancipation of farming land and disposition of financial cliques in the aftermath of the war took away almost all properties from the farming giants. At this time, the Soke branch of the family, having no remaining heirs, became extinguished, much to the sorrow of other branches. My grandfather was not the eldest son, so our branch of the family is not in the direct line of the Rokunojos. His residence was built in Ijimino, where an earlier ancestor settled, and, though we have spread to different cities during this modern age of hustle and bustle, it is still my family’s official domicile address.